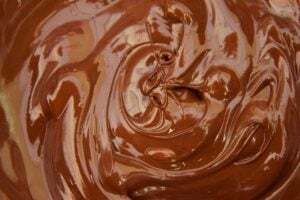 Sentiment Charts: Did somebody say Melt-Up? The point of this article is to discuss a couple of charts I recently shared on Twitter, as well as a couple of charts that haven't yet seen the light of day, and a chart from the latest weekly survey of Finance Twitter (which asks about equity and bond positioning/views based on technicals vs fundamentals). -Investors have clearly undertaken a major reassessment of the "fundamentals". -Whether it's surveyed sentiment, analyst expectations, or punters on Twitter, optimism has become the dominant mood of the market. -It's tempting to become "fearful as others are greedy", but the challenge is that these are the conditions that can set off a virtuous cycle the likes of which have the power to steamroll contrarian bears. 1. Bullish Fundamentals: First up is a look at the survey I mentioned. 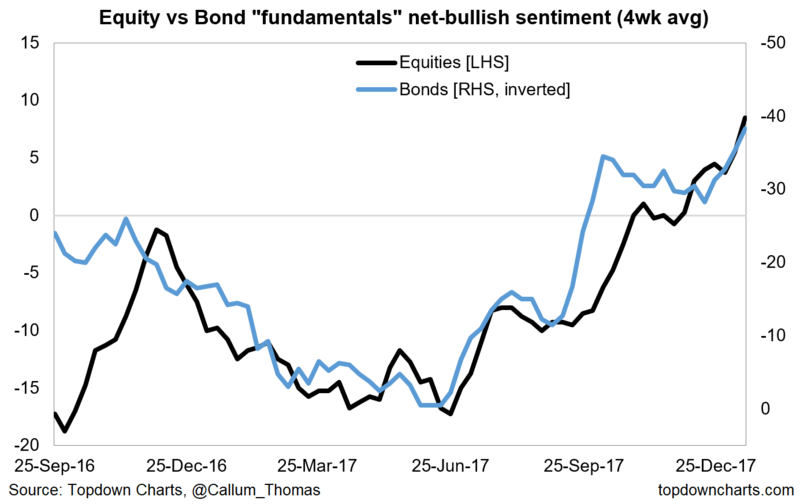 This chart is one of my favorites from that data series - it shows the (smoothed) net-bullish responses for the "fundamentals" side of the survey (again, the survey asks whether respondents are bullish or bearish for fundamental vs technical rationale). This chart shows you there has been a massive reassessment of the fundamentals since the middle of last year. And if you look at the survey response details it's consistent across equities and bonds and is consistent across both the bullish and bearish responses on the fundamentals side. 2. Bullish Analysts: This chart provides a good follow-on and is really quite astounding. 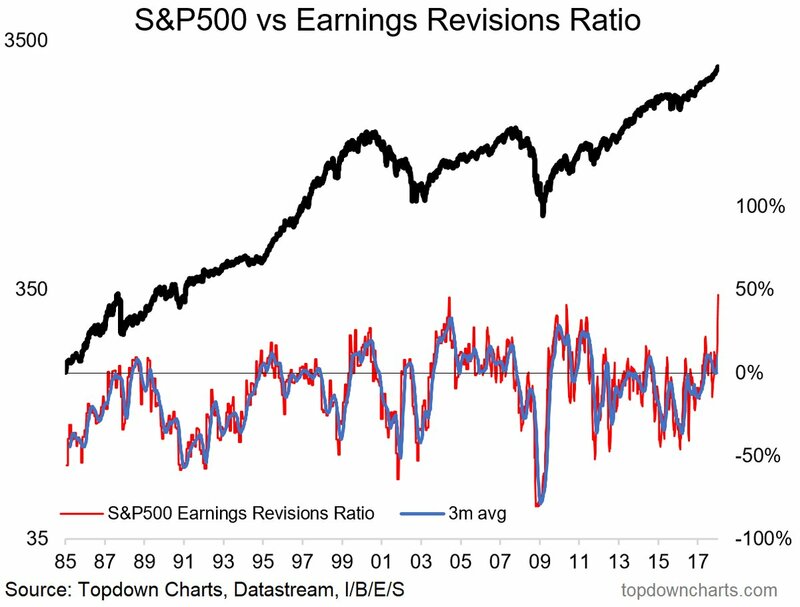 It shows the Earnings Revisions Ratio for the S&P500 [based on the Thomson Reuters I/B/E/S data, and calculated as = (revisions up - revisions down)/(revisions up + revisions down)]. The punchline is it's at an all time high. That is, the overwhelmingly dominant earnings forecast change has been to the upside. This continues the general upwards trend in this indicator seen since 2015/16, but of course the latest spike has much to do with the tax cuts - which likely proffer as much of a sentiment boost as an actual economic boost. Hopefully it's not a case of one hand giveth (the tax cuts) and the other hand taketh (a potential government shutdown as early as Friday)! 3. 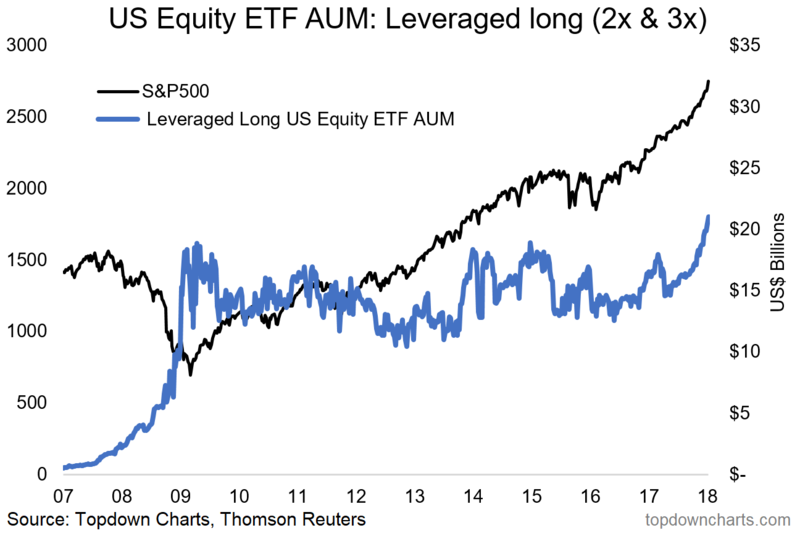 Leveraged Bullish ETF: The next one shows a measure of stockmarket leverage - the total Assets Under Management in the major leveraged-long US equity ETFs (both 2x and 3x). As of the latest reading, there was over US$21 billion in AUM in these relatively specialized trading instruments. This is an all time high, and represents a breakout from a habit of ranging seen over the past almost 10 years. 4. 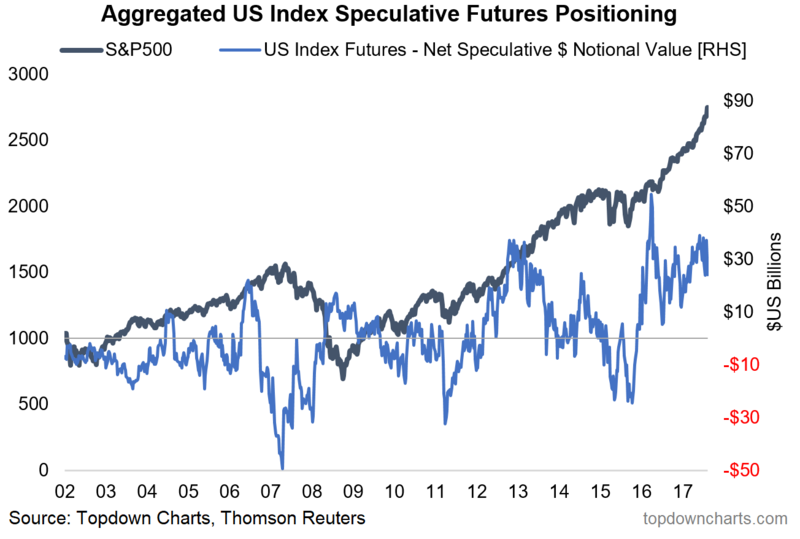 Bullish Futures Speculators: On a very similar note, this one shows an aggregated view (across the various types and flavours of US index futures e.g. the S&P500 Emini, DJIA futures, NASDAQ, Russell 2000, S&P MidCap index). Specifically we are looking at the net notional value for non-commercial traders (i.e. professional speculators). As of the latest reading, this metric sat at US$24 billion. Versus history this is at the high end, but similar to the previous chart - on a vs market cap basis it's relatively small in the scheme of things and on a standardized basis does not look that high. Still it is note-worthy that both these measures of stockmarket leverage have moved higher - consistent with the sentiment signals. 5. 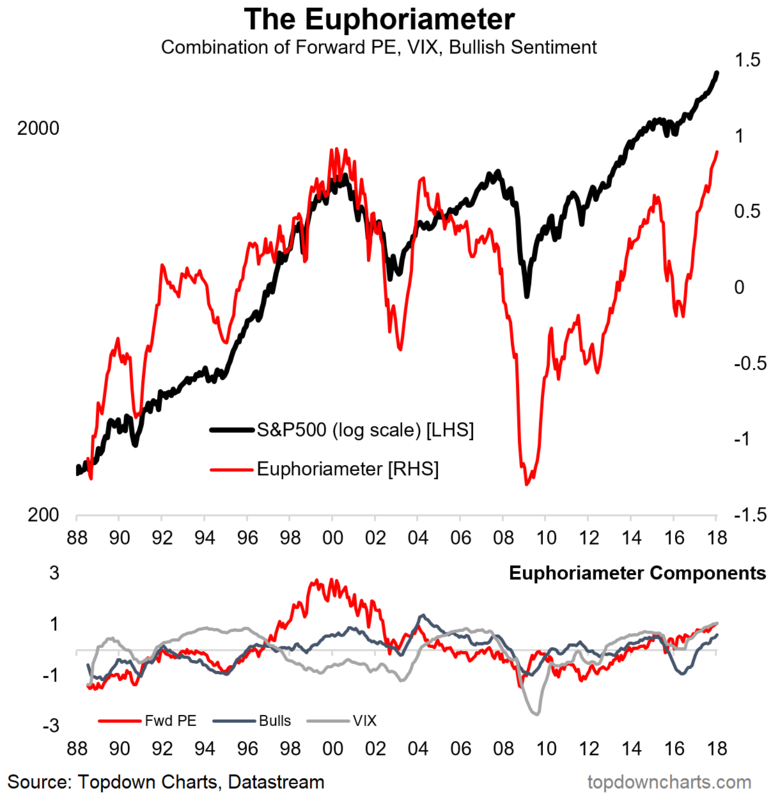 The Euphoriameter: The final chart combines market-based and survey-based measures of investor sentiment, and the bottom line is that this indicator is very close (0.02pts) away from making an all time high. In other words - on this indicator investor euphoria has grown to match that seen at the height of the dot com bubble. It makes me wonder where things might be sitting if all those new traders playing in the crypto space were to instead have waded into the stockmarket. In some ways, maybe the crypto-mania has extended the life of the bull market by enticing away the marginal speculative dollar. On that one time will tell, and hey, if nothing else the world now has a hoard of freshly minted traders/investors who have cut their teeth on the trials and triumphs of financial markets... perhaps in an accelerated fashion!